I bought 1996's THE MASQUERADE OVERTURE with high expectations. I had found much to enjoy on the first Pendragon album I'd heard (NOT OF THIS WORLD - see my review), and overwhelmingly glowing reviews here had led me to believe that "MASQUERADE" was the key Pendragon disc to own, and supposedly and as good as, or better than its 2001 successor. Some months and many listens later, however, I am more disappointed in my purchase than not. Don't get me wrong: this is not a bad effort, as such, but I find it to be quite "safe," with a pronounced "prog by numbers" quality. This instant familiarity likely won't be as much of an issue for listeners who are newly come to prog, but I have been avidly listening to this kind of music for some thirty-odd years. 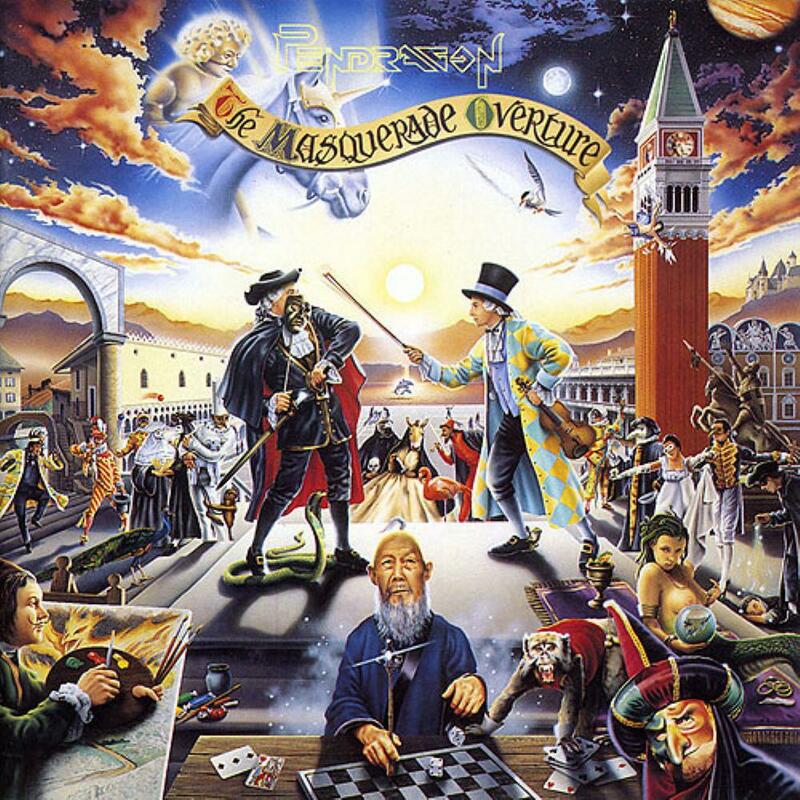 Having cut my prog teeth on such classic acts as early Genesis, Yes, Floyd and ELP, I can't help but feel a distinct sense of déjà vu when I spin THE MASQUERADE OVERTURE. Many critical prog ingredients (including soaring, Hackett-like guitars, generous dollops of synth, "deep" introspective lyrics, and some fetching cover art with pleasingly retro fold-out cardboard packaging) are indeed present, but -- what is perhaps most essential to good art -- originality is decidedly sparse. Still, if you can forgive the band's cookie cutter character (an issue for me, to varying degrees, with neo prog in general) there's some passably good material here -- but also a plentitude of padding. The opening title track has the requisite "sweeping" synth strings, and an over-the-top (hey, where would prog be without a conviction in its standing as "serious" music?) choral section that gets matters off to a pretty promising start, and the following "As Good As Gold" and "Paintbox" are nice enough (if a bit sugary) stabs at prog pop. "The Pursuit of Excellence," with its near-histrionic vocals, is overblown, and does precious little for me, while "Guardian of My Soul" is predictable and overlong. (It's as if the band were drawing heavily upon some "Idiot's Guide to Making Prog" for their "inspiration" and determined to visit every chapter: "Hmmm. I think we need a good old wash of majestic mellotron here, then another faux-Hackett lead break, followed by some bombastic drums and another time change. Now cue the triumphant choir and synth solo...") Been there - done that! As others have indicated, "The Shadow" is perhaps the high point here: this is what "progressive rock" used to sound like, and what much "neo" prog ("regressive progressive?") sounds like today. Good, but a tad overlong, and for me, not quite as grand as it seems to think it is: "Cue the Tony Banks Lamb-era synth break. now bring up the choir again. There! That should make the old progholes misty for the halcyon days of yore!" At long last, the album proper (there is one bonus track, the live but bland "The Last Man On Earth" on this recent re-issue) ends with "Masters of Illusion." (I wonder if the song's title is self-referential; but it's probably not - such winking self knowledge would only puncture the band's obvious sense of their own importance.) All of the "how to make progressive rock" tricks are pulled out yet again for this near thirteen minute "epic," but once more I find the material to be uninspiring, eminently predictable, and too long. Clearly, Pendragon are aiming for a majestic and moving end to the album here, but again they fall short of the mark, and even resort to a forced-sounding fadeout to end the piece. I know this review won't win me any friends among Pendragon's many devoted fans, and I can say that those fans will no doubt thoroughly enjoy this disc. Still, this album has been done before, and better, many times in the 70s. The sound was new and exciting then, but this is mere pre-chewed, regurgitated, spoon-fed imitation. Not one I play often - though I'd really hoped it would be. Better than "poor," but not quite "good" -- let's call it "fair." Two-point-four-nine stars, ruthlessly rounded down to two: followers, younger prog fans, and those on an unabashed prog nostalgia-trip only!